Karen Gillan was born in Inverness in 1987. She developed a love for acting after attending several youth theatre groups and taking part in various school productions. At the age of 16, she decided to pursue her career further and left school to study acting at Edinburgh's Telford College. She went on to secure a place at the Italia Conti drama school in London and landed her first role in the Scottish drama Rebus. Parts in Channel 4's Stacked, The Kevin Bishop Show and James Nesbitt's supernatural horror film Outcast followed. In 2007 she was scouted by a modeling agency in that year's London Fashion Week. 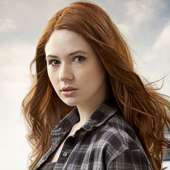 She was cast in the role of Amy Pond in Doctor Who in May 2009. She made her first on-screen appearance as Amy Pond in "The Eleventh Hour" with her cousin Caitlin Blackwood portraying a young Amelia (Amy) Pond. Karen Gillan had though appeared in Doctor Who previously, as a soothsayer, in the 2008 Tenth Doctor story "The Fires of Pompeii". Karen Gillan left Doctor Who in May 2012, along with Arthur Darvill (who played her co-companion and husband Rory Williams) – their last story to be filmed was "The Power of Three". Since then she has played the part of supermodel Jean Shrimpton in the BBC Four film We'll Take Manhattan. She has also been cast as Brittney in a re-working of William Shakespeare's Romeo and Juliet called Romeo & Brittney by David Baddiel. She has also been cast in comedian Charlie Brooker's television series A Touch of Cloth. As the first companion of the Eleventh Doctor, Amelia ‘Amy’ Pond was always destined to make a significant impression on the viewers, as she was the companion who had to wait the longest until the time came for her to travel with The Doctor. Having first met The Doctor when the newly-regenerated Eleventh Doctor crash-landed in her back garden when she was seven years old, Amy was subsequently left behind when The Doctor was forced to take the TARDIS on a short hop to the future to stabilise the damaged engines, resulting in him travelling twelve years into the future instead of the five minutes he’d promised. Despite her anger at The Doctor’s delay in returning for her - resulting in her visiting four psychiatrists for her ‘delusion’ about her ‘Raggedy Doctor’, Amy being reassigned because she kept biting them -, after The Doctor had defeated the mysterious Prisoner Zero’s attempt to destroy Earth, Amy was finally able to accept his offer to travel with him, grinning broadly as her ‘raggedy madman with a box’ took her on an incredible journey through time and space. In the best tradition of female companions, Amy was a very compassionate person, expressing sympathy for the tortured mental state of famous artist Vincent van Gogh when she met him during a trip to investigate a mysterious alien figure in one of his paintings ("Vincent and the Doctor"), as well as working to help the robotic Professor Bracewell find his humanity after he realised his true nature as a Dalek robot ("Victory of the Daleks") and treating the robot RVN-73 as a person - to the point that she nicknamed him Arven - despite Earth being decades away from declaring such robots sentient ("Paradox Lost"). Although Amy was briefly attracted to The Doctor, to the extent that she kissed him in the aftermath of their first confrontation with the Weeping Angels - nearly resulting in Amy’s death when she was ‘possessed’ by an Angel until The Doctor managed to erase the Angel that had ‘infected’ her from history ("The Time of Angels/Flesh and Stone") -, she eventually came to recognise that she preferred the stability of Rory Williams to the more unpredictable thrills of life with The Doctor when faced with two illusionary realities created by the mysterious Dream Lord, rejecting one reality simply because Rory had died in it ("Amy's Choice"). Their relationship was temporarily erased when Rory fell into a crack in time that wiped him from existence, but The Doctor was eventually able to restore Rory to existence by undoing the cause of the cracks - the destruction of the TARDIS after an unknown entity took control of it ("The Pandorica Opens/The Big Bang") -, resulting in reality being restored just in time for Amy’s wedding to Rory. Despite their romantic potential being cut off, The Doctor and Amy remained close, with Amy at least once describing The Doctor as her best friend ("Let's Kill Hitler"), and retaining a strong faith in him regardless of the odds against them; even when history was changed so that the Daleks conquered and destroyed Earth in 1963, turning Amy into a temporal paradox as she faded in and out of existence now that she could never have been born, she refused to give in to despair, trusting that The Doctor would be able to keep her stable and restore Earth ("City of the Daleks"). Her strong sense of will is particularly reflected in her connection to The Doctor, with Amy far more willing to explore a life balanced between normal life and travelling in the TARDIS rather than exclusively choosing one or the other, her and Rory occasionally returning to Earth to live normal lives in London - Rory continuing his nursing career while Amy’s jobs varied between modelling and travel writing - even as they still chose to travel with The Doctor when the opportunity arose. Although some of her strength of will may have come from her contact with the crack in time granting her a degree of immunity to changes in history - to the extent that she partly remembered The Doctor even after he was erased from history ("The Pandorica Opens/The Big Bang") or when history was broken when River changed a fixed point ("The Wedding of River Song") -, there is no question that Amy was a very stubborn companion, whether in the TARDIS or in real life. Despite her lack of official qualifications, Amy regularly showed a useful ability to think on her feet and deal with complicated situations, once even piloting the TARDIS based on The Doctor’s instructions when she was alone in the ship and had to recover The Doctor and their current allies ("Hunter's Moon"), and on another occasion tricking an alien ship attempting to create a duplicate of her by claiming that The Doctor was from Mars as it scanned her memories to trick her duplicate into alerting The Doctor that something was wrong ("The Glamour Chase"). Although she was strong-willed, Amy was also rather impulsive; not only did she run away with The Doctor on the night before her wedding - albeit just because she wanted to travel with him rather than an explicit distaste for the idea of getting married -, but her curiosity often prompted her to take some dangerous risks, such as looking at a crack in time when she had been ‘infected’ by an Angel reflected in her eye that would kill her if she kept her eyes open for too long ("The Time of Angels/Flesh and Stone"), or volunteering to infiltrate a school in Venice even when their available evidence suggested that it was controlled by vampires that nearly resulted in her being turned ("The Vampires of Venice"). As time went on, however, Amy began to find a greater balance between courage and practicality, accepting The Doctor’s lead when he nominated her to represent humanity in a debate with a Silurian Elder ("The Hungry Earth/Cold Blood"), although she still made such impulsive decisions such as accepting a time-manipulating watch that would allow her to relive periods of time to accomplish four days’ worth of activities in a few hours, resulting in her owing the watch’s creators ten years after borrowing only four days before The Doctor repaid the debt for her ("Borrowed Time"). However, regardless of her appreciation for the opportunities that life with The Doctor gave her, it was also responsible for a particularly difficult period of Amy’s life. At some point following her and Rory’s honeymoon - which they spent on a honeymoon planet - the planet having married an asteroid and on its own honeymoon - for a time ("Death of The Doctor") before they acquired tickets to a luxury space cruiser ("A Christmas Carol") -, Amy was abducted by the Order of The Silence, a mysterious group who sought The Doctor’s death to prevent the fulfilment of an ancient prophecy, and replaced with a duplicate of herself. While Amy’s mind maintained a remote ‘link’ to her duplicate across time and space, allowing her other self to travel in the TARDIS and her to experience the events as though they were happening to her, her pregnancy progressed while her real body was kept prisoner by the Silence, the Silence having abducted her with the intention of taking her child - conceived in the TARDIS and therefore possessing aspects of Time Lord DNA - to use as a weapon against The Doctor ("A Good Man Goes to War"). Despite the Silence’s attempt to keep The Doctor unaware of their abduction of Amy, The Doctor was eventually able to track down the original Amy, but he was too late to prevent the Order taking her baby away so that she could be raised as a weapon against him, only for Amy and Rory to learn that their daughter would become River Song from the older River. Having eventually managed to track down River’s younger self - who had lived in Leadworth under the guise of their friend Melody, also known as ‘Mels’, resulting in her paradoxically inspiring her own name when Amy named Melody after Mels -, she regenerated into her River Song appearance before sacrificing her remaining regenerations to heal The Doctor, The Doctor leaving her in the future so that she could acquire the training and career that he knew she would possess from his past/future meetings with her ("Let’s Kill Hitler"). With ‘Melody’ essentially lost to them, Amy and Rory resumed their travels with The Doctor, Amy experiencing a particularly difficult adventure when The Doctor unintentionally took them to a planet under quarantine for a deadly plague, resulting in an alternate version of Amy being created who had been confined by the planet’s doctors for over forty years because they couldn’t accept that she didn’t have the disease and the temporally-contained nature of the quarantine meant that The Doctor was late rescuing her. Although the younger Amy was able to convince her future self to help The Doctor and Rory rescue her, The Doctor was forced to abandon the older Amy to non-existence as the TARDIS wouldn’t be able to handle the paradox ("The Girl Who Waited"). Shortly after this, Amy’s faith in The Doctor drew them to a ship where a minotaur-like being was being kept prisoner and ‘feeding’ from the faith of those drawn to the ship, forcing The Doctor to break Amy’s faith in him in order to starve the minotaur to death ("The God Complex"). Faced with the consequences of his impact on Rory and Amy’s lives, The Doctor took them both back to London, wanting to give them a chance at a normal life rather than run the risk that he would be responsible for their deaths. Following their return to modern life, Amy and Rory appeared to do well, Amy going on to become a model for Petrichor Perfume - ‘For the Girl Who’s Tired of Waiting’, the perfume’s name based on a password the TARDIS had used at one point ("The Doctor's Wife") -, but they were reunited with The Doctor when River nearly collapsed history by trying to prevent herself from killing him, only for The Doctor to restore history by faking his death (Amy setting up the death of the mysterious Madame Kovarian - the woman responsible for her abduction - before the timeline ended, wanting revenge for the loss of her daughter, even if she was shaken by this action once history was restored) ("The Wedding of River Song"). Although The Doctor was willing to let Amy and Rory think that he was dead along with everyone else at first, he still clearly missed them - to the point that he once called the TARDIS to ask for Amy’s help before remembering that she wasn’t there -, culminating in him being convinced to make contact with the Ponds once more after helping a family reunite amid the chaos of the Second World War ("The Doctor, The Widow and the Wardrobe"), having been reminded of the importance of family. After attending Christmas dinner with the Ponds - who had kept setting a place for him despite him being absent for two years -, The Doctor subsequently began to drop in on them when he wanted some company, noting that he found it particularly hard to say goodbye to Amy as she had been the first face he had witnessed in his current body, thus ensuring that he had a particular bond with her in his eleventh incarnation ("The Power of Three"). Although Amy briefly tried to end her relationship with Rory when she discovered that her experiences on Demon’s Run had rendered her infertile, knowing that Rory had always wanted children and not wanting him to lose the chance to be a parent, but during a trip to the Dalek asylum the two were able to reconcile when Rory convinced Amy that he didn’t care about her inability to have children ("Asylum of the Daleks"). With their near-divorce resolved, the two remained close from then on, finding a more comfortable balance between travelling with The Doctor and maintaining a life with friends on Earth, Amy moving on from her modelling career to become a travel writer ("The Power of Three"), even if she still enjoyed the opportunity to travel with The Doctor, recognising her friend’s need to have someone to help him maintain the human perspective and compassion that separated him from his more ruthless enemies ("A Town Called Mercy"). However, despite The Doctor’s friendship with them, Amy and Rory finally chose each other over the Time Lord during a final confrontation with the Weeping Angels ("The Angels Take Manhattan"), when they were forced to commit suicide to create a paradox that would contaminate the Angels’ food source - they had witnessed an older version of Rory dying in a building where the Angels kept people they had sent into the past -, the resulting paradox undoing the Angel’s plans and ending their presence in New York. However, although Amy and Rory were resurrected by the paradox, a single survivor managed to separate Amy and Rory from The Doctor forever by sending them into the past of New York, where the disruption caused by the Angels’ presence would prevent him from ever taking the TARDIS to see them again. Despite this loss, Amy managed to leave The Doctor a final message in the afterword of a book that River had written to provide them with vital information about the crisis, Amy assuring him in the afterword that she and Rory had lived a good life together, that they would always love him and cherish their time together, and asking him to find someone to travel with him so that he would never be alone. Although The Doctor initially ‘retired’ to Victorian London out of bitterness at Amy’s loss - even retaining her reading glasses as a memento of her -, he was inspired back into action by new companion Clara Oswald and an encounter with an early version of The Great Intelligence, The Doctor resuming his travels as he was reminded of the joy that the universe could offer him regardless of the pain he had experienced ("The Snowmen"). Even centuries after he had last seen her, Amy remained a strong influence on The Doctor’s eleventh life; as he began to regenerate, the Eleventh Doctor hallucinated that Amy was present in the TARDIS, her child-self running around the console room before her adult self walked down to the console to say goodbye one last time, ensuring that her face was the last face that would be seen by the Eleventh Doctor just as it had been the first ("The Time of The Doctor"). While Amy had several interesting moments, "The Pandorica Opens/The Big Bang" was unquestionably her best; not only did she do what few non-Time Lords have done and meet her past self - albeit an alternate past self -, but, at the conclusion of the episode, she ‘remembered’ The Doctor back into existence, drawing him to her with the strength of her memories of him despite the fact that he had been erased from existence.